Post-Halloween Shopping | Barbie Who? Happy November! I hope everybody had a fantastic Halloween. I did; our family dressed up as The Avengers and had dinner with friends. It was a lot of fun! Today, in our post-candy haze, we went shopping. This trip was much more terrifying than most. We started off at the craft store. I needed to get some yarn and ribbon for a hat I am making for my cousin. While there, we saw this handsome lady in the fabric section. 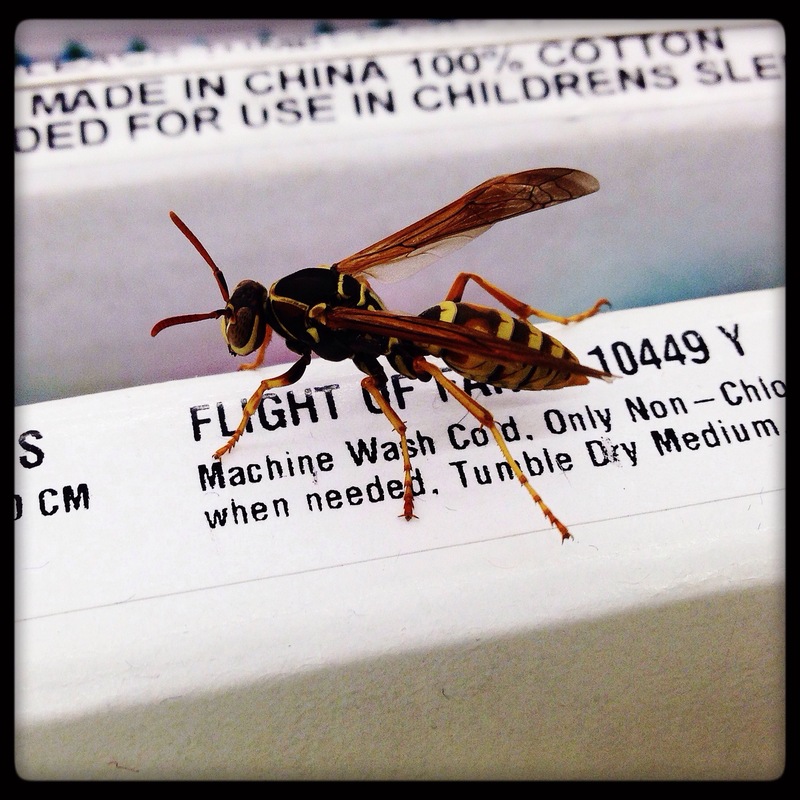 This wasp wasn’t in a bad mood, but it was strange seeing her inside a craft store. I’m sure she got in by hitching a ride on another customer. It’s the time of year where insects die, and it isn’t unusual for them to try to come inside to stave off the inevitable. A rogue mouse did the same thing last week. Luckily we have a cat who managed to take care of the problem. After the craft store, we went to a Halloween store to see what they had on clearance. We bought a scary reaper to hang on our door next year. This year we had a talking head, but that got annoying when the wind caused it to speak at all hours of the day and night. This will be a much-appreciated improvement next year. I feel bad that it will spend 11 months in a box, but that’s the price you pay for a great deal. After that excursion, we went to the thrift store next door. They had half-off Halloween stuff, and they did not disappoint. While rummaging through toys, I found this gem. 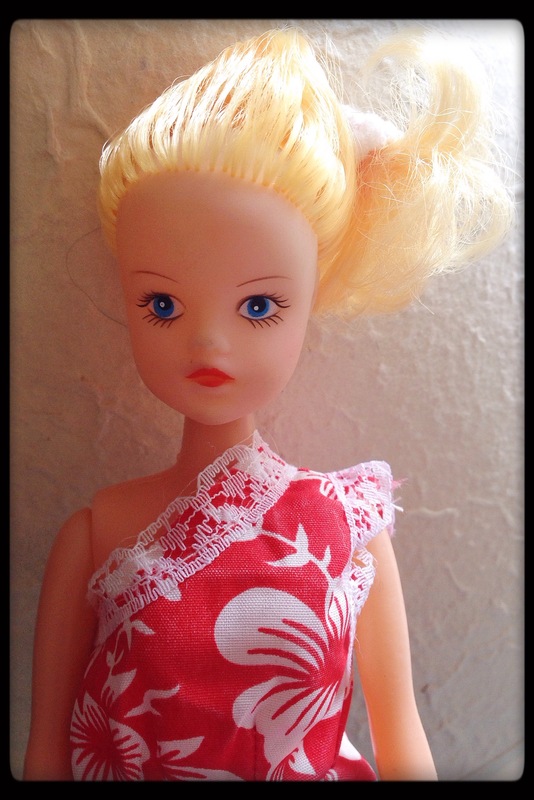 Your eyes are not deceiving you; this is a headless, shin-less, one-armed Barbie. I couldn’t help but laugh; I found headless Ken’s partner. The amazing part is how clean the cuts were. It looks like they just snapped right off. 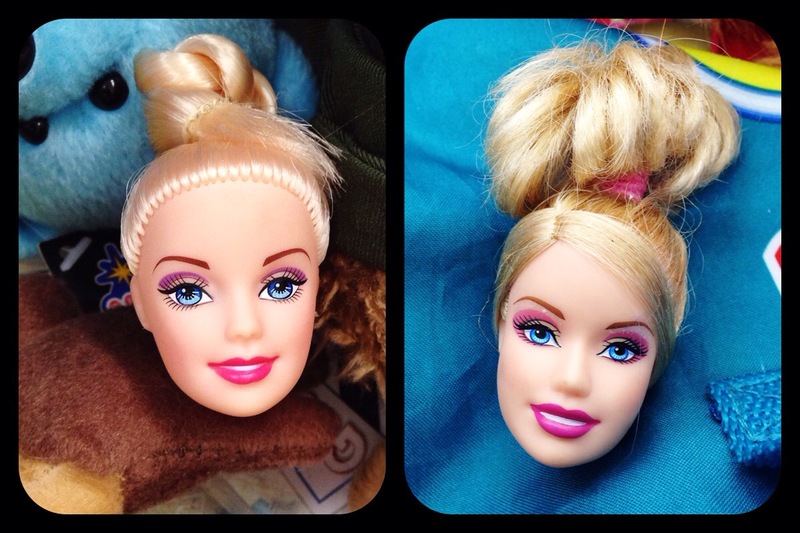 Then I found two Barbie heads while rummaging through the rest of the bins. To nobody’s surprise, I did not find another headless torso. Considering this is the same thrift store I found the headless Ken doll, one could postulate that one of the heads belongs to him. Or maybe somebody collects the torsos. Or they just don’t pay attention to the dolls donated. Perhaps kids in the store play too rough with the toys. It’s a tough call as to which it is; you never know with second-hand stores. I was almost done sorting through the bin when I saw it. It was the most terrifying thing of all. It was vintage. It was creepy. It stared at me with it’s empty eyes and vaguely childlike face. Words cannot describe her; I can only hope this picture gives you an idea of the horror that emerged from the bin. Okay, okay, okay. This doll isn’t the scariest thing in the world, but there is just something about her that creeps me out. I think it’s the face; there is just something strange about the shape and makeup choices. Sometimes I wonder who green-lights these toys…. Thus concluded our shopping adventure. Now I can focus on crocheting. With some luck, the next post will be the jacket. I am ironing out a few small details with finishing the coat and creating the pattern to go with it. Hopefully it will be worth the wait. Happy November everybody!